At its peak, the school attracted scholars and students from near and far with some travelling all the way from Tibet, China, Korea, and Central Asia. :169 Archaeological evidence also notes contact with the Shailendra dynasty of Indonesia, one of whose kings built a monastery in the complex. Inspired by the journeys of Faxian and Xuanzang, the pilgrim, Yijing (also known as I-tsing), after studying Sanskrit in Srivijaya, arrived in India in 673 CE. 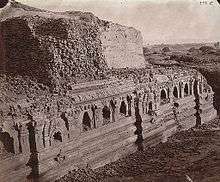 He stayed there for fourteen years, ten of which he spent at the Nalanda Mahavihara. :144 When he returned to China in 695, he had with him 400 Sanskrit texts which were subsequently translated. 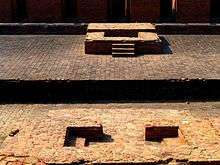 While its excavated ruins today only occupy an area of around 1,600 feet (488 m) by 800 feet (244 m) or roughly 12 hectares, Nalanda Mahavihara occupied a far greater area in medieval times. :217 It was considered an architectural masterpiece, and was marked by a lofty wall and one gate. 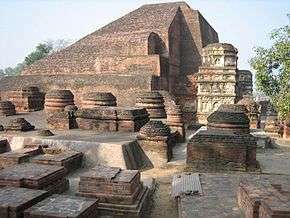 Nalanda had eight separate compounds and ten temples, along with many other meditation halls and classrooms. On the grounds were lakes and parks. Nalanda was a residential school, i.e., it had dormitories for students. In its heyday, it is claimed to have accommodated over 10,000 students and 2,000 teachers. Chinese pilgrims estimated the number of students to have been between 3,000 and 5,000. 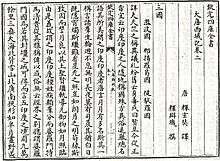 Xuanzang himself studied a number of these subjects at Nalanda under Shilabhadra and others. :65 Besides Theology and Philosophy, frequent debates and discussions necessitated competence in Logic. 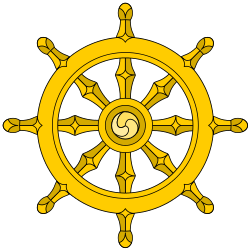 A student at the Mahavihara had to be well-versed in the systems of Logic associated with all the different schools of thought of the time as he was expected to defend Buddhist systems against the others. 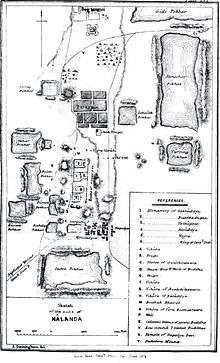 :73 Other subjects believed to have been taught at Nalanda include law, astronomy, and city-planning. Other forms of Buddhism, such as the Mahayana Buddhism followed in Vietnam, China, Korea and Japan, flourished within the walls of the ancient school. A number of scholars have associated some Mahayana texts such as the Shurangama Sutra, an important sutra in East Asian Buddhism, with the Buddhist tradition at Nalanda. :264 Ron Epstein also notes that the general doctrinal position of the sutra does indeed correspond to what is known about the Buddhist teachings at Nalanda toward the end of the Gupta period when it was translated. A number of other ruined structures survive. Nearby is the Surya Mandir, a Hindu temple. The known and excavated ruins extend over an area of about 150,000 square metres, although if Xuanzang's account of Nalanda's extent is correlated with present excavations, almost 90% of it remains unexcavated. 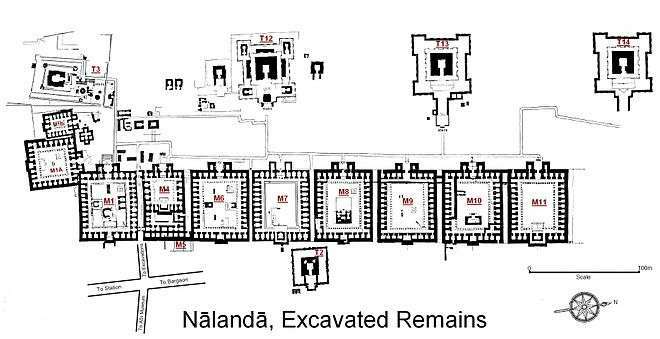 Nalanda is no longer inhabited. 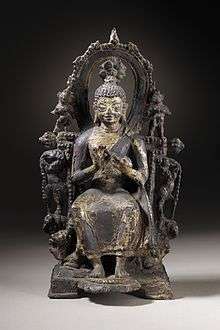 A number of Buddhist sculptures have been excavated from Nalanda and its vicinity. They are now in Patna Museum, Indian Museum Calcutta and Los Angeles County Museum of Art in addition to a small museum at Nalanda. 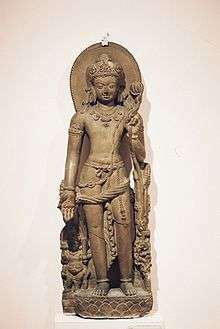 A stone statue of the Khasarpana Lokeshvara form of Avalokisteshvara from 9th-century Nalanda. 1 2 3 4 5 "Nalanda". Archaeological Survey of India. Retrieved 18 September 2014. 1 2 Le, Huu Phuoc (2010). Buddhist Architecture. Grafikol. pp. 58–66. ISBN 0984404309. 1 2 3 4 5 6 7 8 9 10 11 Scharfe, Hartmut (2002). Education in Ancient India. Handbook of Oriental Studies. 16. Brill. ISBN 9789004125568. ↑ "Four sites inscribed on UNESCO's World Heritage List". whc.unesco.org. UNESCO World Heritage Centre. 15 July 2016. Retrieved 15 July 2016. ↑ "Chandigarh's Capitol Complex makes it to UNESCO's World Heritage List". Economic Times. 18 July 2016. Retrieved 18 July 2016. 1 2 3 Frazier, Jessica, ed. (2011). The Continuum companion to Hindu studies. London: Continuum. p. 34. ISBN 978-0-8264-9966-0. 1 2 3 4 5 Monroe, Paul (2000). Paul Monroe's encyclopaedia of history of education, Volume 1. Genesis Publishing. ISBN 8177550918. Retrieved 14 September 2014. 1 2 3 4 5 6 7 8 9 10 11 12 13 14 15 16 17 18 19 20 Sankalia, Hasmukhlal Dhirajlal (1934). The University of Nālandā. B. G. Paul & co.
1 2 3 Wayman, Alex (1984). Buddhist Insight: Essays. Motilal Banarsidass. ISBN 8120806751. 1 2 3 Kulke, Hermann; Rothermund, Dietmar (2004). A History of India (Fourth ed.). Routledge. Retrieved 1 October 2014. 1 2 3 4 5 6 7 8 9 10 11 12 13 14 15 16 17 Sukumar Dutt (1988) [First published in 1962]. 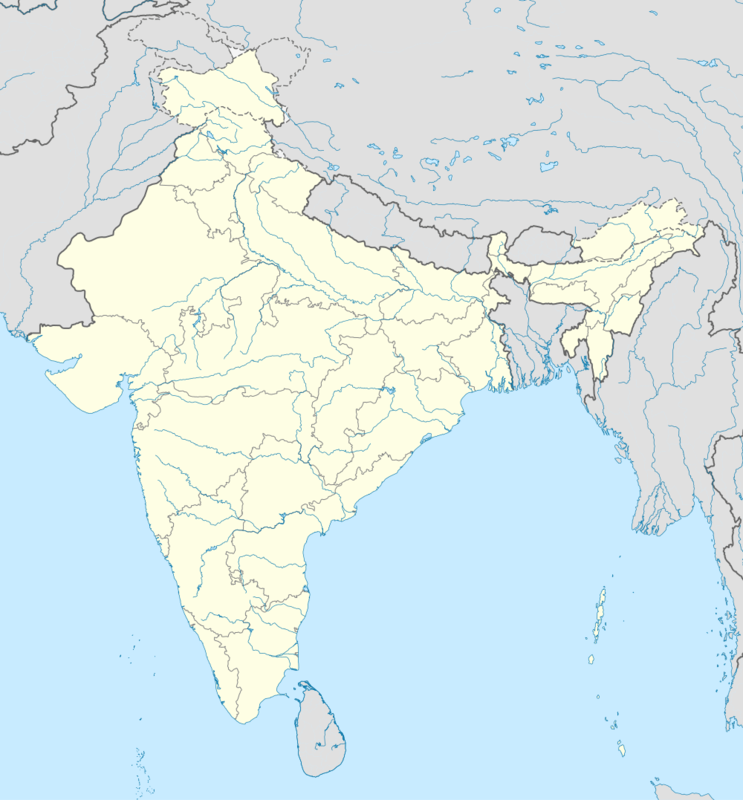 Buddhist Monks And Monasteries of India: Their History And Contribution To Indian Culture. George Allen and Unwin Ltd, London. ISBN 81-208-0498-8. 1 2 3 Chandra, Satish (2004). Volume 1 of Medieval India: From Sultanat to the Mughals. Har-Anand Publications. p. 41. ISBN 8124110646. 1 2 3 4 5 6 7 8 9 10 11 12 13 14 15 16 17 18 19 Ghosh, Amalananda (1965). A Guide to Nalanda (5 ed.). New Delhi: The Archaeological Survey of India. ↑ Sastri, Hiranand (1986) [First published in 1942]. 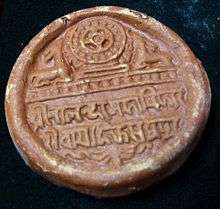 Nalanda and its Epigraphic Material. New Delhi: Sri Satguru Publications. pp. 3–4. ISBN 8170300134. Retrieved 30 November 2014. ↑ Sastri, Kallidaikurichi Aiyah Nilakanta (1988). Age of the Nandas and Mauryas. Motilal Banarsidass Publishers. p. 268. ISBN 812080466X. ↑ Altekar, Anant Sadashiv (1965). Education in Ancient India. Nand Kishore. ISBN 8182054923. 1 2 3 4 Wriggins, Sally Hovey (1996). Xuanzang : a Buddhist pilgrim on the Silk Road. Boulder, Colo.: Westview Press. ISBN 0-8133-2801-2. Retrieved 9 December 2014 – via Questia. (subscription required (help)). ↑ Beal, Samuel (2000) [First published in 1911]. The life of Hiuen-Tsiang. Trubner's Oriental Series. 1 (New ed.). London: Routledge. p. 111. ISBN 9781136376290. Retrieved 9 December 2014. 1 2 Joshi, Lal Mani (1977). Studies in the Buddhistic Culture of India During the Seventh and Eighth Centuries A.D. Motilal Banarsidass Publications. ISBN 8120802810. ↑ Buswell Jr., Robert E.; Lopez Jr., Donald S. (2013). Princeton Dictionary of Buddhism. Princeton, NJ: Princeton University Press. ISBN 978-0-691-15786-3. 1 2 Wink, André (2002). Al-Hind : the making of the Indo-Islamic world, Volume 1 ([3rd ed.]. ed.). Boston, MA: Brill. ISBN 0-391-04173-8. Retrieved 15 December 2014 – via Questia. (subscription required (help)). ↑ Sharma, Suresh Kant (2005). Encyclopaedia of Higher Education: Historical survey-pre-independence period. Mittal Publications. p. 29. ISBN 8183240178. ↑ Garten, Jeffrey E. (9 December 2006). "Really Old School". 1 2 3 Rene Grousset (1971) [First published in French in 1929]. In the Footsteps of the Buddha. Translated from French by JA Underwood. Orion Press. ISBN 0-7661-9347-0. ↑ Khurshid, Anis (January 1972). "Growth of libraries in India". International Library Review. 4 (1): 21–65. doi:10.1016/0020-7837(72)90048-9. Retrieved 1 December 2014. ↑ Bhatt, Rakesh Kumar (1995). History and Development of Libraries in India. Mittal Publications. ISBN 8170995825. ↑ Berzin, Alexander (2002). "The Four Indian Buddhist Tenet Systems Regarding Illusion". Retrieved 11 July 2016. ↑ Mookerji, Radha Kumud (1998) [First published in 1951]. Ancient Indian Education: Brahmanical and Buddhist (2 ed.). Motilal Banarsidass Publications. p. 565. ISBN 8120804236. ↑ Walser, Joseph (2005). 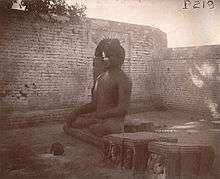 Nāgārjuna in Context: Mahāyāna Buddhism and Early Indian Culture. Columbia University Press. p. 102. ISBN 023113164X. 1 2 Collins, Randall (2000). The sociology of philosophies: a global theory of intellectual change. Volume 30, Issue 2 of Philosophy of the social sciences. Harvard University Press. p. 240. ISBN 978-0-674-00187-9. ↑ Humphreys, Christmas (1987). The Wisdom of Buddhism. Psychology Press. p. 111. ISBN 0700701974. ↑ "The Shurangama Sutra (T. 945): A Reappraisal of its Authenticity". ↑ Jarzombek, Mark M.; Prakash, Vikramaditya; Ching, Francis D.K. (2011). A Global History of Architecture. John Wiley & Sons. p. 312. ISBN 0470902450. ↑ Basham, A. L. (1954). The wonder that was India: a survey of the history and culture of the Indian sub-continent before the coming of the Muslims. London: Picador. p. 266. ISBN 978-0330439091. ↑ Minhaj-ud-Din, Maulana (1881). 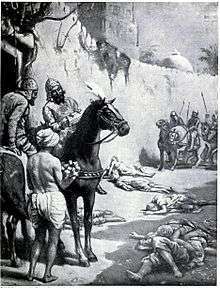 Tabakat-i-Nasiri – A General History of the Muhammadan Dynasties of Asia Including Hindustan. Translated by Major H. G. Raverty. p. 552. Retrieved 22 December 2014. 1 2 Chos-dar, Upasaka (1959). Biography of Dharmasvamin (Chag Lo Tsa-ba Chos-rje-dpal), a Tibetan Monk Pilgrim. Translated by George Roerich, Introduction by A.S. Altekar. p. xix. Retrieved 24 December 2014. The account was narrated by Dharmasvamin to his student, Chos-dar. ↑ Kim, Jinah (2013). Receptacle of the Sacred: Illustrated Manuscripts and the Buddhist Book Cult in South Asia. University of California Press. p. 52. ISBN 0520273869. ↑ "Five of the Leaves from an Ashtasahasrika Prajnaparamita Manuscript". Asia Society. Retrieved 25 September 2014. ↑ "Astasahahasrika Prajnaparamita Sanskrit palm-leaf manuscript". Retrieved 25 September 2014. ↑ "Getting to Nava Nalanda Mahavihara (NNM), Nalanda". Nava Nalanda Mahavihara. Retrieved 25 September 2014. ↑ "Welcome to Nava Nalanda Mahavihara (NNM)". Nava Nalanda Mahavihara. Retrieved 25 September 2014. ↑ Singh, Santosh (September 1, 2014). "Nalanda University starts today with 15 students, 11 faculty members". The Indian Express. Retrieved 3 September 2014. ↑ "Sushma Swaraj inaugurates Nalanda University". Economic Times. 19 September 2014. Retrieved 19 September 2014. 1 2 "Nalanda University reopens". Times of India. 1 September 2014. Retrieved 10 September 2014. ↑ Chatterjee, Chandan (1 September 2014). "Nalanda route to prosperity — Varsity will boost trade, feel residents". The Telegraph. Retrieved 10 September 2014. ↑ "The Archaeological Museum, Nalanda". Archaeological Survey of India, Government of India. Retrieved 10 September 2014. ↑ Chaudhary, Pranava K (Dec 27, 2006). "Nalanda gets set for relic". Times of India. Retrieved 10 September 2014. ↑ "Nalanda Multimedia Museum". Prachin Bharat. Retrieved 10 September 2014.